National Geographic Children's Books, 9781426333576, 96pp. Follow her story as she carries out an epic search and struggles to survive while studying the world's most endangered great ape. When Galdikas saw her first image of an orangutan in the wild, she was immediately captivated. It haunted her and she found its gaze "almost hypnotic." She moved to Borneo, where she made it her life's mission to study and work to protect these mysterious creatures. Like primatologists Jane Goodall and Dian Fossey, Galdikas was driven by incredible ambition and a fascination with apes and human origins, making her way to the harsh rain forests of Indonesian Borneo when she was just 25 years old. She set up a simple camp, named after her mentor, Louis Leakey, and proceeded to look ... and look ...and look for wild orangutans, one of the most elusive species on the planet. Her studies brought these critically endangered apes to the world stage, and they are still making an impact today. Now in her 70s, Dr. Galdikas has conducted the longest running study of any wild mammal by any single scientist. Award-winning author Anita Silvey explores the life and legacy of this incredible and little-known primatologist. 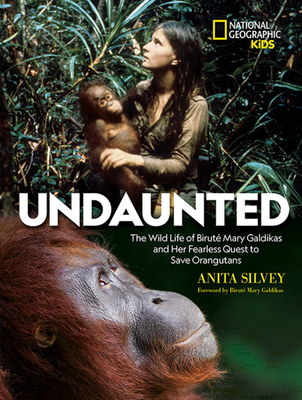 With unparalleled storytelling, Silvey offers unique insight into Galdikas' childhood, her work with National Geographic, her passion of raising awareness about conservation, and her mission of securing a future for orangutans. As the author of 100 Best Books for Children, 500 Great Books for Teens, and Everything I Need to Know I Learned from a Children's Book, ANITA SILVEY has devoted 40 years to promoting books that will turn the young -- and families -- into readers. Her most recent books are Untamed: The Wild Life of Jane Goodall and Let Your Voice Be Heard: The Life and Times of Pete Seeger. She has appeared frequently on NPR, The Today Show, 60 Minutes, and various radio programs to talk about the best books for young people. In a unique career in the children's book field, Silvey has divided her time equally between publishing, evaluating children's books, and writing. Her lifelong conviction that "only the very best of anything can be good enough for the young" forms the cornerstone of her work. Formerly publisher of children's books for Houghton Mifflin Company and editor in chief of The Horn Book magazine, she currently teaches modern book publishing, children's book publishing, and children's book author studies at several colleges.